Imaan is on 4.5ml of CDS in 9oz of water - dosing 1oz, 8 to 9 times per day. We have done more than 7 'E' on Imaan. Less yeasts poo now. Much calmer. Less asking for food. I think he is doing very well. Great report from school too. I had a skype appointment with Angelica, our homeopath. The remedy Heloderma Suspectum is still indicated as his constitutional remedy. The other possible constitutional remedies are T-Rex (wth???) or Python. Also, still doing Priorix 1M CEASE clear - muscle tested every time. 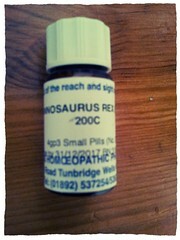 I knowww.. Tyrannosaurus Rex... there is an actual homeopathic remedy made from T-Rex fossil... *faint*. I can't find the proving for this on the net though. I talked to Helios and they said it's an unproved remedy. Wonder what's next Imaan... Meteorites perhaps, or Aliens or certain soils from the Moon.. Thought Lachesis remedy was scary enough. .. When you are an autism mom, you face so many types of learning curves, for so many different things. Bring it on!.